From the last episode, we learned that Joon-Soo has a visitor. 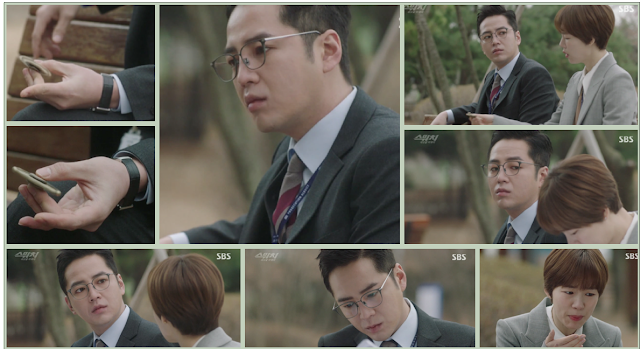 His mentor but most importantly he’s the Chief Prosecutor of Internal Affairs, Woo Jae-Shik. Both Do-Chan and Ha-Ra, eyes wide open, stood dumbfounded. What if they get caught! The plan is for Ha-Ra to meet Woo at the elevators while Do-Chan takes the stairs. In his rush going down the stairs, Do-Chan almost collides with Woo who is also taking the stairs due to his desire to maintain his health. Recovering quickly, Do-Chan acknowledges his mentor, and they both engage in a general conversation. Woo makes a ‘casting a fishing line’ gesture with his hands, but Do-Chan misunderstands and thinks Woo is referring to golf. Woo, a little baffled by Do-Chan’s reply, also finds it weird that Do-Chan does not remember Ms. Kang, the lady from the snack bar. After making their way back into the office, Woo admits that he would not recognize Joon-Soo if they met on the street. Ha-Ra arrives and is surprised to see them both sitting together. While Ha-Ra seeks shelter from behind her folio, Do-Chan realizes that she is not able to bail him out and that he can handle this, being very polite and acting with respect. Woo advises Joon-Soo to lead a normal life, live a long, and quiet life, and to be flexible. That is how he will be able to continue as a prosecutor. Was this advice or a subtle warning? Convincing Woo he has changed a lot, Do-Chan forgets that Baek Joon-Soo would never have crossed his legs in front of his elders (revealing the bottom of your shoe is a sign of disrespect). Ha-Ra quickly disappears behind her folio, while everyone else looks at Do-Chan with disbelief. Chief prosecutor Yang comes in and directs Woo out of the room, while an angry Ha-Ra deals with Do-Chan. Despite explaining that this is an outdated and old fashion custom, Do-Chan is not able to calm Ha-Ra down until he reminds her that he won’t be Joon-Soo forever. They both agree to not see each other after the mission is complete. Nam Seung Tae, bound and gagged, remains Geum’s prisoner but is now under the watch of Jo Sung-Doo. While being led up a flight of stairs, Nam takes the chance to escape. However, in the process of pushing Sung-Doo, Nam also falls, causing them both to careen down the stairs. Nam's actions infuriates Sung-Doo, causing him to strangle Nam with his belt. Not thinking about his actions and being caught up in his emotions, Sung-Doo realizes that ultimately he killed Nam. 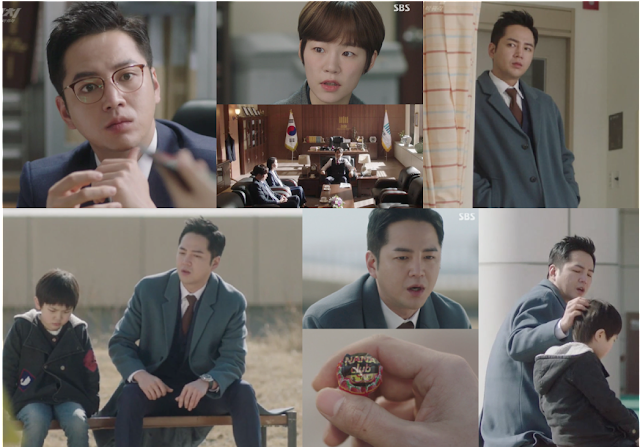 Sung-Doo, summoned to Geum’s office, where Manager Kim reminds Sung-Doo that he has had too many chances and should prepare himself this time. Soon after entering the room, Sung-Doo gets down on his knees and pleads for forgiveness, begging Geum not to send him away, for his late mother’s sake. But, who is Sung-Doo to Geum? It is just another working day at the office when Baek Joon-Soo comes across a news article about a pregnant woman who has been urgently transported to a hospital after arriving at the ferry terminal. She was a drug mule and LSDT, a newly developed drug made in Colombia, had been inserted into her. As Do-Chan mentioned LSDT, Ha-Ra’s interest peaks. The real Baek Joon-Soo previously was working on this type of case. The District Prosecutor Jung Do-Young also meets with the Chief Prosecutors and advises them that he wants Criminal Department 6 to handle this case as Baek Joon-Soo had handled a similar case the previous year. Following up on their investigation, Ha-Ra and Do-Chan visit the woman in the hospital, only to discover that she is unconscious, has miscarried, and also has a young son who is yearning for his mother to recover. One of the drug sachets had burst, poisoning her body. While Ha-Ra talks with the woman’s doctor, Do-Chan sits outside on a park bench with the young son. He tries to calm the boy down but ends up talking gibberish to the extent that through a stream of tears the boy simply yells, ‘I don’t know what you are saying’. The boy continues to cry, nagging Do-Chan to catch the bad man. He tells Do-Chan that his mother told him prosecutors catch the bad man. If he is a prosecutor he can catch the bad man who made his mother ill.
As if to encourage Do-Chan, the boy hands him a Chupa Chups with a sticker of the Nana Club logo on it. Do-Chan ruffles the boy’s hair as Ha-Ra steps outside the hospital and sees a softer side to Do-Chan. During the drive back to the office, Do-Chan remains quiet and contemplative. Ha-Ra curiously asks Do-Chan what he and the boy talked about. Do-Chan tells her that the boy wants them to catch the bad man. Ha-Ra, with a cynical smile, wants to know if Do-Chan promised the boy that they would catch the drug dealers. He replies, "lying is my job." However, in a somber tone, Do-Chan asks Ha-Ra a rhetorical question, "we should catch those rats, right?" Discouraging Do-Chan not to have any ideas, she tells him that it takes time to reach the top of the drug pusher hierarchy, the ones they do catch are just the runners. Back in his home, Do-Chan awakes after having a bad dream. Director Bong enters and reveals that Do-Chan has had this dream on numerous occasions and that each time he has that dream their plans go wrong. Later in the day, Do-Chan is sitting on a park bench in a park, swirling his sheriff fidget spinner. Ha-Ra soon joins him, bringing some of her paperwork. Feeling rather perplexed, she verbalizes her frustration, rousing Do-Chan’s curiosity. After politely asking to have a look, he takes the case file from Ha-Ra. Do-Chan begins quoting legal jargon, revealing to a shocked Ha-Ra that he has actually been to law school. Back at the office, Do-Chan tries to excuse himself so he can leave work early. Ha-Ra does not excuse him as there was still work to be done. Next tactic, excuse himself for a rest in the night duty room. Instead of getting any sleep, Do-Chan and his team visit the Nana Club, playing roles he had scripted for his team. So Eun-Ji plays the role of a pregnant woman who has an argument with her partner (Do-Chan) regarding the cost of having a baby. Do-Chan claims his guitar is more important than the child they are expecting and leaves Eun-Ji crying at the entrance of the club. The bouncer of the club approaches Eun-J with a proposition. In a private room in the club, her guitarist partner joins them. The bouncer announces that he may be able to assist them financially. Eun-Ji says she'll do whatever her partner agrees to and leaves to join the rest of the team who are in a surveillance van. Meanwhile, the bouncer at the Nana Club continues to contemplate Do-Chan’s character. It seems Do-Chan is a little too eager to begin the negotiations. Suddenly, someone appears behind Do-Chan and covers his mouth with a cloth that has been doused with some sort of sedative. Do-Chan’s team are frantic to find him, only to discover his glasses lying on the floor. Working into the night, Chief Prosecutor Yang runs exasperated into the Ha-Ra's office, telling Ha-Ra they have a huge problem. Nam Seung Tae was found hanging in a tree. Murder disguised as suicide. By this time, Oh Ha-Ra realizes that Do-Chan may not be actually sleeping. Frantically searching each bed in the night duty room, she cannot find him. Putting pieces together of the events that occurred earlier, Ha-Ra comes to the conclusion that, although Do-Chan has tricked her once again, he might actually placing himself in danger. In a darkened street near a warehouse, Do-Chan wakes up to discover he's the captive of a group of thugs holding metal baseball bats and planks of wood. The leader of the thugs is the bouncer from the Nana Club. He removes Do-Chan’s wig, and thinking Do-Chan is really Baek Joon-Soo, greets him as prosecutor. Not knowing whom he was dealing with, Do-Chan portrays himself as Baek Joon-Soo, until he realizes these thugs want really Baek Joon-Soon dead. Manager Kim approaches, dressed all in black, and asks Do-Chan if he is actually Baek Joon-Soo. Do-Chan thinking he has a chance continues playing the role of prosecutor, not realizing he has just sealed his own fate. Without uttering a word, Kim’s men close in on Do-Chan. Do-Chan tries to endure and renegotiate, attempting to convince Kim that he is not Joon-Soo but actually Sa Do-Chan. Before he can finish telling them his name, one of the men takes a swing at Do-Chan, hitting him directly on the head. Collapsing onto a sack, Do-Chan blacks out. The lights in the street go out, to be replaced with car headlights. Four men wearing gas masks get out of the car and roll tear gas canisters towards Kim and his men. Unprepared for the attack, Manager Kim and his men are caught off guard. While three of the men who wear the gas masks are fighting with Kim’s men, the fourth man quickly walks towards Do-Chan. Supporting the back of his neck, Do-Chan’s rescuer applies a gas mask onto Do-Chan, securing its fitting. Through blurry eyes, Do-Chan sees his rescuer and in the background the others fighting. Amongst the chaos, he witnesses his rescuer loose his prosthetic left hand. With heavy breathing and a hurting head Do-Chan lapses into unconsciousness.